Key Difference: Body Mass Index (BMI) is a body measurement technique that measures body weight as a ratio against body height. Bioelectrical Impedance Analysis (BIA) is commonly used for estimating body composition, and in particular body fat. Back in the olden days, humans were foragers, traveling from one place to another in search of food. Then with the invention of agriculture, people settled down and started working the fields, then followed the Industrial Revolution, and people then started to work the factories. However, then came the digital age, and now people are stuck in a cubicle all day staring at a computer. This has resulted in a sedentary lifestyle, i.e. much reduced physical activity, which has given rise to obesity. After people realized the negative impact of reduced exercise and movement, there were many different types of body measurement techniques developed to find out just how much of an impact did it have on an individual body. BMI and BIA are two different types of body measurement techniques that help people determine where they fall on the scale of obesity. Body Mass Index (BMI) is a body measurement technique that measures body weight as a ratio against body height. The proper definition of BMI states it as “the individual's body mass divided by the square of their height”, hence it can be said that it measures the body’s weight in relevance to its height. It is calculated as mass(kg)/height(m)2. Alternately it can also be calculated as (mass(lb)/height(in)2)x703. BMI is also often calculated on the basis of a table or chart, which usually has different BMI categories segregated on it. However, BMI has been criticized as it very limited. It only takes into account the height and weight. It ignores other aspects such as body composition, body fat, fitness level or age. Due to this, an short athlete and a tall obese person often have the same BMI, even though one is obese and the other very fit and healthy. 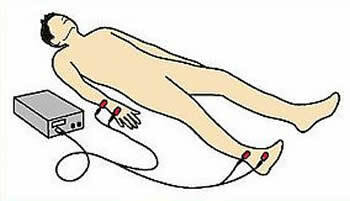 Another body measurement technique is Bioelectrical Impedance Analysis (BIA). However, BIA has a larger scope than BMI. BIA is commonly used for estimating body composition, and in particular body fat. It measures body composition by sending a very small electrical signal through the body via electrodes which are attached to the body. This signal is carried through the body by water and fluids. Fat contains less water than the rest of the body; hence it takes longer for the electrical signal to pass through it. By measuring the time it takes for the signal to pass through the body, and taking into account the person's height, weight, body type, gender, age, and fitness level, it is possible to calculate the percentage of body fat, fat-free mass, hydration level, and other body composition values. While BMI only takes into account height and weight, the BIA is an actual test that takes into account the person's height, weight, body type, gender, age, and fitness level. 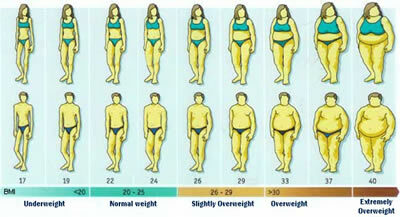 Furthermore, BMI does not give an accurate result as it is limited to few factors. BSA, on the other hand has only 3% to 4% margin error. However, there are other factors that can have an impact on the reading such as dehydration, and eating or excising just before the test. A method for estimating body composition, and in particular body fat. No formula, as it is a medical test.